The average lifespan of a mouse is a fleeting two to three years; and so when a certain mouse celebrates his 90th birthday on November 18th, a feeling of incredulity is sure to be present. But this isn’t a regular mouse by any means, in fact, he’s nothing short of extraordinary. He’s a cultural icon, an unmistakable face, a timeless friend— and his name is Mickey Mouse. It is hard to believe that 90 years after the simple animated mouse made his first appearance, his popularity not only endures but also continues to inspire countless individuals, from young children, adults chasing the dream of becoming animators, and anyone who can maintain being young at heart. Indeed it was the dream of two young hearted animators that brought the world’s most famous mouse into existence. The year was 1928, and two 27-year old buddies from Kansas City joined together to brainstorm ideas for a new animated character. 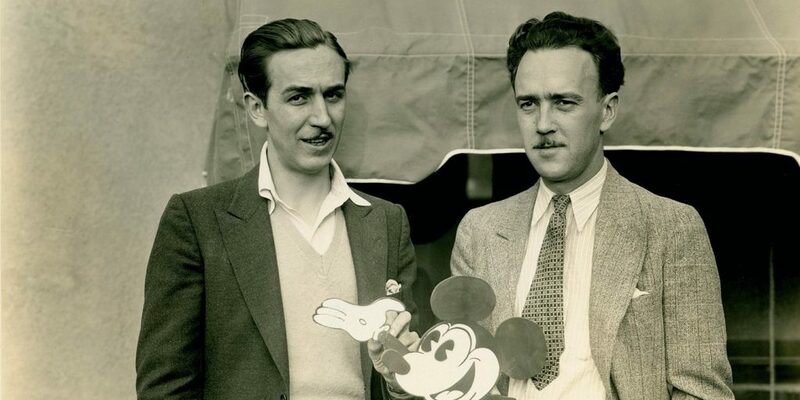 Their names were Ub Iwerks and Walt Disney, who although were obscure nobodies, would soon find themselves with global immortality (especially Disney of course). The Walt Disney Studios was not quite five years old in 1928, but Walt knew the key to breaking through in the field of animation was to create something totally innovative; with the creation of Mickey Mouse, innovation is exactly what was delivered. When a tame mouse appeared at Disney’s desk, the proverbial light bulb went off and he rushed to tell his animator Iwerks his idea for an animated mouse, a character hoped to surpass the duo’s earlier creation Oswald the Lucky Rabbit. Initially called “Mortimer Mouse”, Lilian, Disney’s wife, convinced him that Mortimer was too snobbish a name for a cartoon and so “Mickey” was born. After months of production work and arduous work to create a click track for the musicians, the world received its first official introduction to Mickey in the short film Steamboat Willie on November 18th, 1928. Produced on a budget of $5,000 its status as a hugely influential, groundbreaking and classic work of early sound animation stands to this day, and was a precursor to all the success Walt Disney would eventually achieve. In a time when silent films were still the norm, the idea of producing an animated feature with sound and pre-recorded music was bold and risky (traits that defined Walt Disney’s outlook on art). Mickey’s whistling and laughter, the sounds of the boat’s whistles and the musical animals were all recorded and synchronized with the picture, making it one of the very first animated films to have sound (and certainly amongst the most successful). 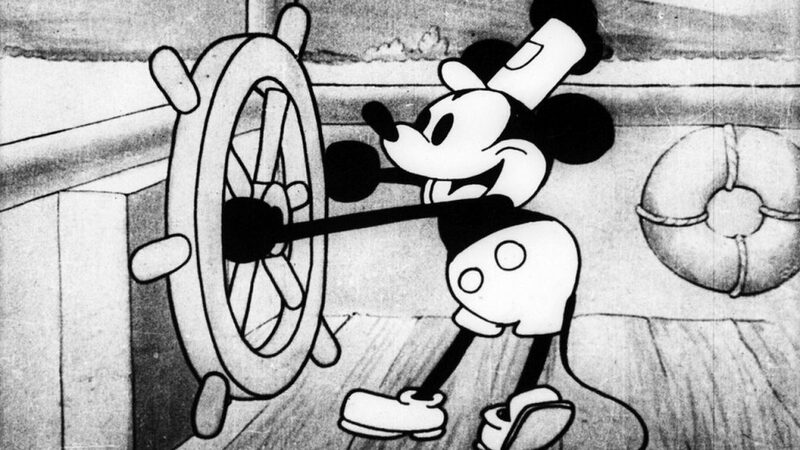 Steamboat Willie’s legacy lies not only with its innovation in animation and sound techniques but as a spearhead for the art of animation to begin flourishing in the United States. Running at just under eight minutes long, Steamboat Willie introduces us to Mickey Mouse as he navigates a steamboat all while whistling a happy tune; when he’s kicked off deck by the captain, he begins his other duties, which include loading livestock onto the boat (and one Minnie Mouse). It’s most interesting that in this appearance, the beloved, friendly Mickey we all know today shows traits of mean-spiritedness; he begins to “play” the various animals on board like musical instruments in a segment that has garnered its fair share of criticism. Of course, it all contributed to the charm of Mickey, who could be at once mischievous and loveable, perhaps like Walt Disney himself. Thanks to Mickey Mouse, Disney was quickly transported out of obscurity and by the end of the decade the mouse would become a household name. With merchandise galore, like the famous wristwatch, and increasingly bold short films like 1935’s The Band Master (the first colored short) the mouse and the Disney empire were well on their way to changing popular culture forever. For his part in creating an icon of Americana, Disney was awarded an Honorary Academy Award in 1932 (the first of his 22 wins) and Mickey himself was awarded a star on the Hollywood Walk of Fame in 1978, the first for an animated character; Steamboat Willie was chosen for preservation in the Library of Congress in 1998. Disney liked to say that it “all began with a mouse” and in many ways it remains true. For without Mickey’s success, who knows what would have happened? Walt Disney always pursued the next best audacious idea but projects like Snow White or Disneyland couldn’t have even been conceived if Mickey Mouse failed and literally sent Walt into bankruptcy. While Mickey’s name has often been used in a pejorative sense for both America and anything considered juvenile, it is difficult to deny the immense impact the character has had on society. Today nearly everyone in the world knows the name and face of Mickey Mouse, and so on this his 90th birthday, it seems fair to speak for most everyone in wishing that very famous mouse a very happy birthday. DC finally gets it right with Wonder Woman meshing epic superhero action with deeper thematic and philosophical elements.